At the top of Fed Square, Il Pom Italian restaurant offers Melbourne’s best people-watching perch over a coffee, lunch or dinner, pinot, grappa or birra. Just look for the red umbrellas. 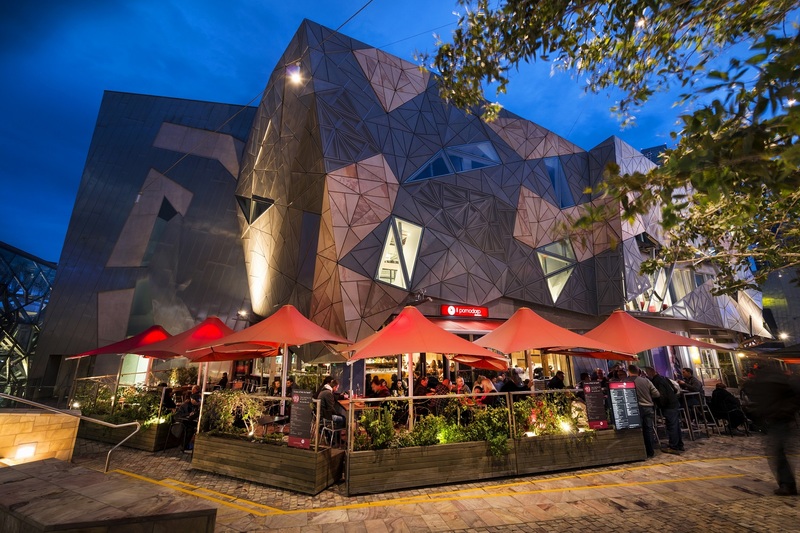 With a large, heated outdoor section, Il Pom Italian restaurant offers a fantastic fully licenced, dining, coffee and function spot in Melbourne’s cultural hub, as well as offsite catering. Great for breakfast, to lunch, lattes and the papers, pre theatre dinner and drinks or supper and grappa after, Il Pomodoro Italian restaurant caters to all whims, from an easily curable caffeine craving to an appetite nothing but four courses inspired by nonna will abate. Il Pom Italian is a versatile space that accommodates both small and large groups –available for private events, larger groups and functions perfect for work parties, birthdays and receptions with its relaxed style for functions of 20 up to cocktail parties for 100 people. Seasonal menus are designed specifically for each function with a choice of finger food or something a little more formal if required. Available online table reservation bookings!